The federal government just finished up its fiscal year on September 30. It was not pretty. We added $1.27 trillion to the national debt. That is nearly double the increase last year. The debt grew about twice what GDP grew for the year. So far, the promised increase in federal revenues because of the tax bill has not materialized. Through the first two quarters, federal receipts were down by over 3%. We don’t have the numbers for the receipts in the third quarter yet, but the government was borrowing at over $100 billion per month in the quarter, so it is unlikely there was much of an uptick. The tax cuts may yet produce the promised revenue increases as there may be a lag time involved but continue to color me skeptical. The national debt now stands at $21.5 trillion. That is about $66,000 for every man, woman and child in the U.S. And that does not include the unfunded liabilities for Social Security and Medicare. The interest paid on the national debt last year was $523 billion. That is up 14% from last year. Thomas Jefferson famously said, “It is incumbent on every generation to pay its own debts as it goes.” He wrote in a letter to a friend that the government should “never borrow a dollar without laying a tax in the same instant for paying the interest annually and the principal within a given term.” He must be rolling over in his grave. 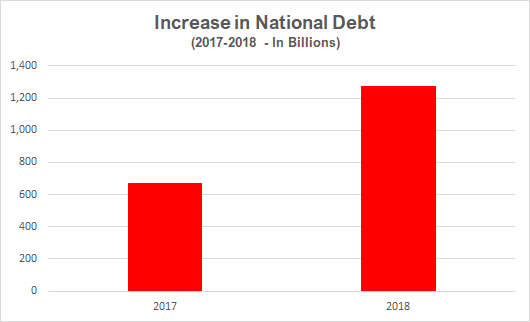 During the years of the Obama administration, Republicans lined up to rail about the massive increase in the national debt. But now that a Republican is in the White House, crickets. Today neither party has the slightest concern about the national debt. Both are too busy shoveling benefits on the special interests that finance their partisan apparatuses. It is going to take bold, courageous leadership to rein in the growing national debt. It is going to take leaders that tell the American people that everyone is going to have to work later into their lives and save more money while they are working. That someone cannot smoke or overeat their entire life and then expect taxpayers to pick up the bill for their healthcare. That private equity bankers should pay the same rate on their earnings that you and I do and to close the other abusive loopholes so dramatically on display last week. That we need to spend whatever it takes to “cure” Alzheimer’s and diabetes, the two diseases that will bankrupt the country if we do not change their current trajectory. The national debt has become so large that the numbers don’t really mean anything to us anymore. Just an endless string of zeros that are someone else’s problem. But the reality is that by running up this massive debt we are borrowing from – no, make that stealing from – our children’s and our grandchildren’s future. So, the next time you want to demand that Congress cut your taxes again or pay for something for you, stop and look into the eyes of your children or grandchildren. What will they think of a generation that would not “pay its own debts as it goes”?